Matthew Lazarchick started his career as a Chef at the age of 14 as a dishwasher in his Father’s restaurant. He continued to work in the restaurant business for five years before attending the Culinary Institute of America and graduated in 1991. Matthew worked at the prestigious Turnberry Isle Resort in Aventura, Fl for his extern. After graduating from the CIA, Matthew returned back to Miami to worked at the famed Mark’s Place to start his professional culinary career. During Matthew’s 6 years in Miami, he has worked for Allen Susser, Mark Millitello and Micheal Swartz. In 1998 Matthew traveled to Budapest, Hungary to become the Personal Chef for the American Embassy. He returned back to the states in 2000 to continue his training as a Chef. He then decided to travel and his next stop was in Colorado to worked at the Aspen Meadows Center as Pastry Chef in Aspen. Following the seasons, Matthew traveled to work on Nantucket Island, Vail and Aspen. 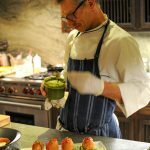 In 2007 Matthew became the Chef of the award winning Osprey Point Inn. He was responsible for developing the wine program as well as the Catering dept. Durning his tenure, Matthew organized 13 weddings, over 100 special events, cooked on Member’s boats as well as client’s homes. Recently Matthew relocated to California and has been working as a private chef in beverly Hills, Santa Barbara and Monticeto. Matthew’s 30 years in the restaurant business as a chef, Pastry chef, baker and caterer makes him a valuable asset in a home. He has traveled the globe and has a valid passport. Matthew has recently relocated back to the West Coast and is based in Los Angeles. Chef Matthew was awesome. First, his food was beyond delicious. His presentation and explanation of each meal served was explained and prepared perfect. His personality was professional and humorous. I can't wait to use him again. Matthew was amazing. He seemed to really enjoy his job and was eager to answer cooking/prep questions while he was working. Definitely not a stuffy chef. His menu was delightful and made people try new things that they actually loved, roasted beets, edamame hummus but the quinoa cakes with tomato jam... OMG big hit. Would definitely use Matthew again. Wow! We were so happy we chose Matt to create an amazing dining experience for our dinner party. My family and our guests loved both Matt and his cuisine. Matt made sure to liaise with us beforehand to understand exactly what we wanted; he went above and beyond with nice little touches for our kids; he made sure to let us know that we didn't need to do anything at all during the entire night; and he is just a super chill, fun and genuinely entertaining personality (if he was cooking for us, we'd love to have him as a guest at our dinner party!). We'd definitely hire Matt again in an instant, and strongly recommend him to anyone seeking to have an amazing meal experience at home.